I had to make another sympathy card this week. It was one of the hardest I've ever done. My childhood best friend Nancy's dad passed away after a short battle with leukemia. We were next-door neighbors until I was 10, and in many ways John was a second father to me. I tend to put butterflies, flowers, trees and/or crosses on most of the sympathy cards I make, but none of those felt right. Finally, it came to me that a sailboat would be perfect. John built a sailboat by hand (literally - no power tools at all) in his backyard. Nancy and I were about five when he finished the boat, took down the shared fence between our houses, and gathered a couple dozen friends and neighbors to carry the boat to a waiting trailer. Over the next 10+ years, I spent many, many days on boats with their family. 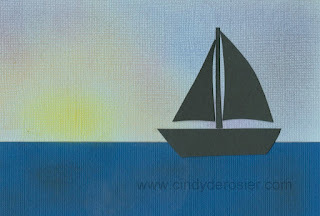 I started by cutting out a white sailboat, set against a beautiful blue sky. It was pretty, but didn't seem to fit the occasion. I changed the sailboat to black and added chalk to the background to create a sunset. Rather than a funeral or a memorial service, the family held a celebration of life. It was wonderful to hear so many (often hilarious) stories about a man who will be missed by all who knew him. This is a beautiful card and so perfect for the situation. The chalk sunset is just the right touch. I am sorry for your loss. This is perfect! So beautiful! I am sure she appreciated it! The sailboat is so perfect! What a beautiful and touching card and I know she must have loved getting it from you. I am so very sorry for your loss, Cindy.